Hi everyone. Hope you are doing great. Everything is looking great in my part of the world. My Sweet Petunia is growing beyond my wildest dreams. The amount of love that I receive from the MISTI community is humbling. I feel so blessed that it brings tears to my eyes. The title of this blog post should be "I Feel Loved". I have to admit that I sometimes I do get overwhelmed. That is when I have to make myself slow down. In the car I will blast a song from my favorite artist Jaime Grace. I will listen to it over and over to the point where I want to raise my hands to heaven. Let's just say that is not a good idea when driving. The lyrics to the beautiful song have a powerful message. I would actually prefer sharing the video to the song than the card video. So thank you for all the love that has come my way. 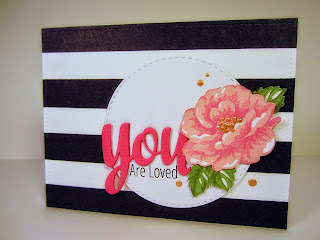 I made this card for my beautiful sister. She was just deployed. I talk about her in the video. 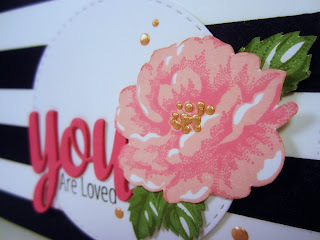 I used the Stippled Blossoms stamp from Stampin' Up. This set is retiring. If you want to order it, then you need to do it now because the new catalog comes out June 2nd. Thanks for stopping by. Please watch the music video.